The Arcorace Luxe Beauty guide for how to prepare for up- coming spray tan. The night before or/ morning of your spray tan appointment, give your body an all over scrub and exfoliation. This will remove any residue build up of excess tan (from previously), product and that dead layer of skin. Doing this will prepare your skin for a blank canvas for the spray tan to soak onto, which gives you a more even result in your colour. Remember not to over scrub! Gentle circular motions all over. Not focusing on just one area for too long as you may cause redness and remove too many layers of skin. eeeekkkkkkk!! 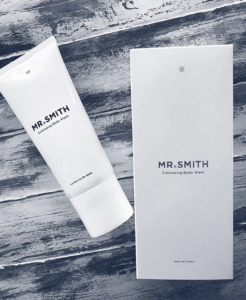 Our recommended product to use is our in salon retail Mr. Smith Exfoliating Body Wash.
Rich in antioxidants and vitamins, the Mr. Smith Exfoliating Body Wash with mango butter, açaí berry and mandarin extract replenishes the skins moisture while also rejuvenating the skin. As always, both products are PETA certified vegan, sulfate, paraben and silicone free. Most important rule… No moisturizers, deodorants or make up should be on your skin before your spray. Doing so may result in an uneven tan. No body like streaks and patches. A quick shower, baby wipes or make up removers can do the trick. Wear loose darker coloured clothing, nothing too tight or too light. If you have a spray tan appointment in the cooler months of winter where there may be a chance of rain, please do bring an umbrella and wear long sleeve tops, longer pants and enclosed shoes in case of wet droplets!